A modern take on vintage herb engravings, these adorable plates will find endless uses on your table. 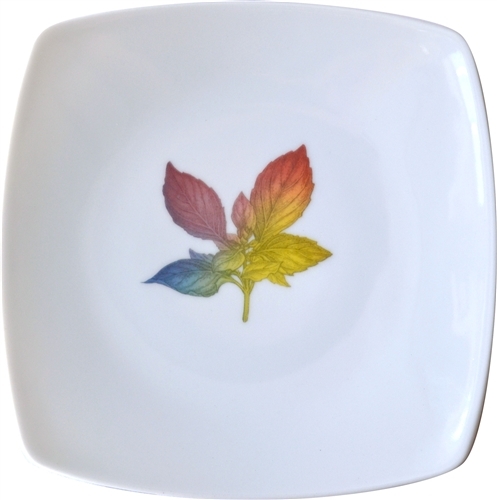 Bright rainbow colors add a splash of happiness to any dining surface. The plate’s soft square shape adds distinction and interest to any table setting. Perfectly sized for appetizers, salads, and cocktail party nibbles. Handmade in America exclusively for Nourish™. Each plate measures 7.25 inches in width. Dishwasher and microwave safe. Combine these unique plates with our Persian Carpet Dinner Plates for a clean, geometric look. Our Menagerie Napkins and Golden Oak Leaf Napkin Rings button everything up! 7.25 inches in width, fine porcelain, handmade in America exclusively for Nourish™. Dishwasher and microwave safe.